In digging into the latest Census numbers, I have been updating all of our office’s work on housing, household formation, affordability and the like. Homeownership continues to be on the rise and I will get to the latest Peak Renter numbers next week. 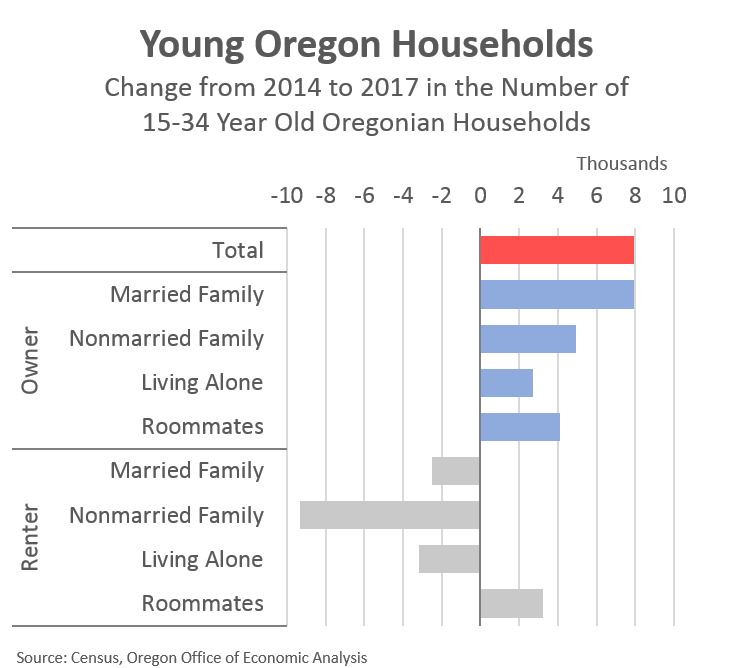 That said, it is clear that the ownership rebound in recent years is concentrated among younger Oregon households. Halfway down this housing research trail I stumbled upon the following chart. The increase in younger owners is primarily among married-couple families. This is important for housing in that homeownership for married-couple families is 20 percentage points higher than for other household types, and they comprise 60% of all homeowners in Oregon. So off on a detour, down the marriage research rabbit hole I went which we will explore a bit on this Fun Friday. I have a typical story I tell when giving presentations on how Millennials are indeed getting married, buying homes, having kids and the like. They are not foregoing these major life events, but they are doing so a few years later than previous generations. The story is largely about how the life cycle effect dominates the trends even though there are, at times, sizable generational effects. In terms of marriage, this next chart shows both the life cycle effect — the arc of the curves; as we age the share of us who have ever been married increases — and the generational effect — each line represents a birth cohort; some are higher or lower than others. This chart fascinates me. We know that the current crop of Millennials are getting married less compared to the Silent Generation and oldest Baby Boomers. However what I was surprised by is that today’s Millennials aren’t that different than the previous century‘s Millennials (the 1885 birth cohort)! Who gets married and at what age has clearly evolved, and continues to evolve today. This evolution is very interesting and Cato Unbound had a great set of articles on marriage a few years back including an article by renowned family and marriage researcher Stephanie Coontz, and an article by economists Betsey Stevenson and Justin Wolfers. The kicker is not that Betsy and Justin are great economists in their own right, which they are, or that they are married to each other, which they are, no, the kicker is that they are renowned for their economic research on love and marriage. You can’t make this stuff up; it’s adorable! What the research finds is that this evolution is in part about the shifting nature of work, in addition to the availability of different products and services that make domestic/household duties easier than in the past. In economic parlance, as Betsy and Justin write in the article, marriage has shifted from a “forum of shared production, to shared consumption.” What that means is marriage is more about love and companionship these days — a hedonic marriage — and it does give rise to assortative mating and the like. Marriage is no longer primarily about matching specialized workers together — one in the marketplace and one at home. 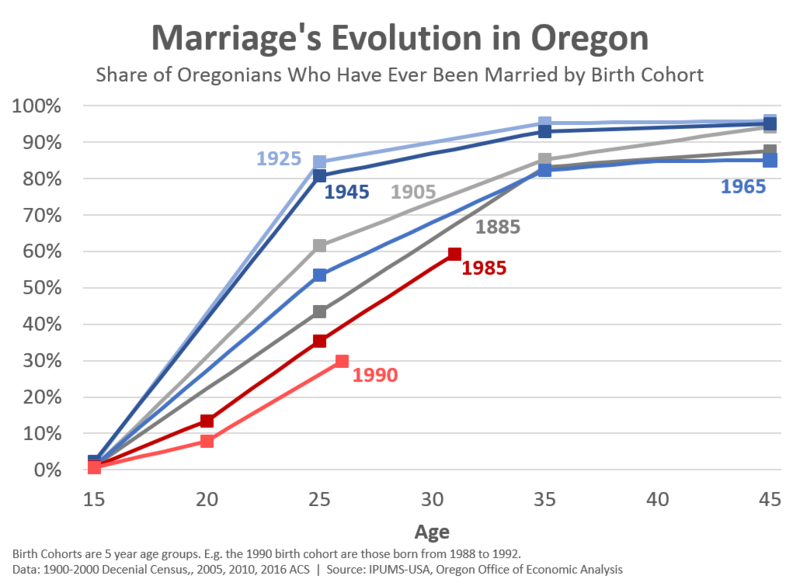 As this evolution continues, we are seeing the median age rise at which Americans and Oregonians first get married. The latest Census data show that here in Oregon this age reached 30 years old for men and 27.8 years old for women in 2017. As far as I can, given available data, these readings in recent years are a record. 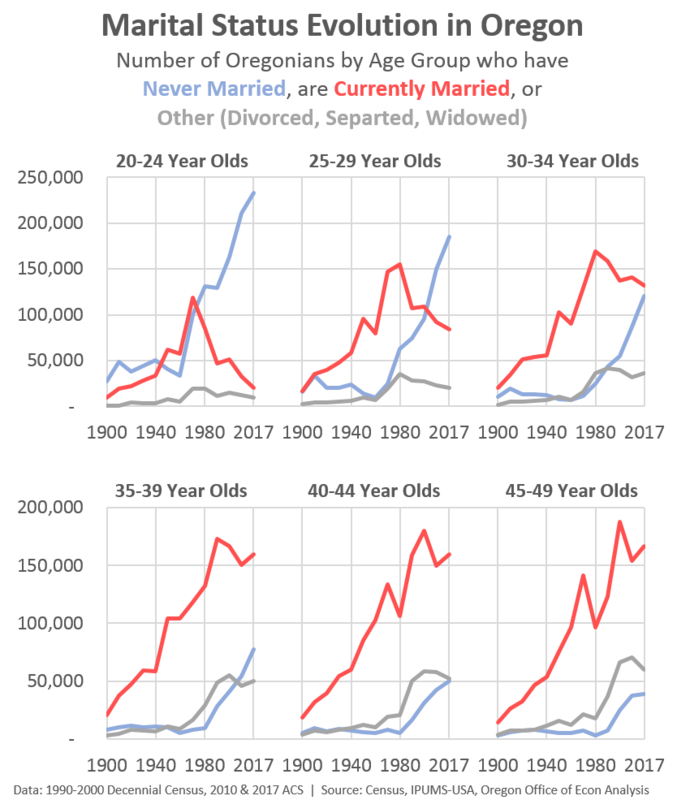 That said, they are more of a return to rates seen 100-150 years ago than they are just a divergence from the high marriage rates at younger ages seen in the 1950s and 1960s, which were themselves records in the other direction. As marital status evolves, we can see the trends by also looking at age cohorts. 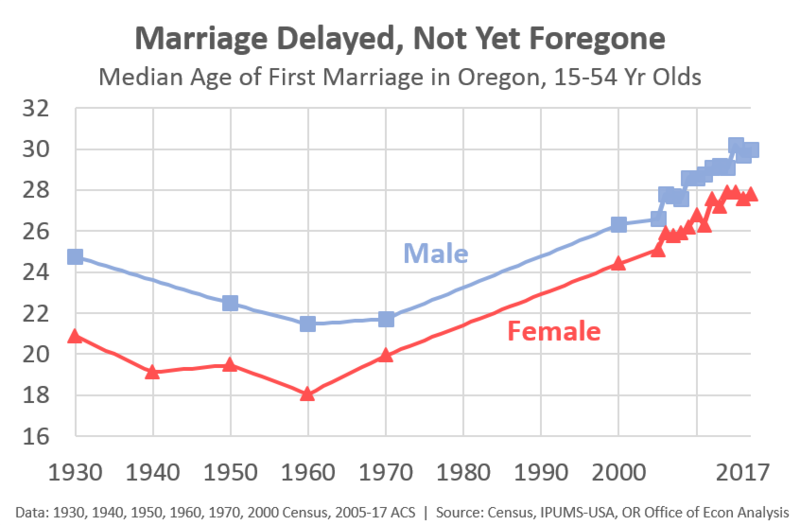 The number of single, never married Oregonians is rising across all age groups. However this increase, coupled with declining marriage rates is especially seen among the 20-somethings. One other interesting thing to note is that the divorce bubble has clearly burst. Divorce is on the decline in recent decades. In their article, Betsy and Justin discuss how the rise in divorces was in part a response to the shift from marriage being about shared production to being about share consumption. To the extent that marriage today really is about love, companionship, and sharing interests and activities together, then it makes sense that divorce is less frequent. All told, marriage patterns continue to evolve. Given the generational data, the median age at first marriage will continue to increase at least in the near-term. These shifts also do have wide-ranging impacts throughout the economy. One of which is the impact on household formation and homeownership. At least when compared to a generation or two ago, there is a longer time period from when one leaves the nest and when one settles down, gets married, buys a house, has kids and so forth. There will also be a larger share of Oregonians moving forward who chose to do none, or just some of these things as well. That said, a majority of Oregonians will still chose to do these major life events, but at a somewhat later age than in the recent past. Stay tuned for at least one future post on birthrates in addition to a follow-up next week on homeownership in Oregon and across the country.